Far Cry 3 does something interesting with its protagonist Jason, presenting him not as a bloodthirsty killer with military training, but as some kid, thrust into a situation well outside his abilities or understanding. When you jump off a cliff, he screams. When you cut open an animal for its skin, no matter how many times you do it, he goes "eeewwww", just like you or I would. When the game opens, he's quite literally running for his life. It has you thinking that, hey, maybe this game will be different to every other shooter ever released. Maybe in this shooter I'll actually be outmatched, my lack of training and experience with military weapons turning me into a vulnerable little bag of exposed flesh, fear and panic. Then, within ten minutes, you're storming a compound of bloodthirsty pirates with an assault rifle, tossing grenades and pulling off headshots, and you realise nothing is different whatsoever. Shame. In narrative terms, and this continues long into the game, Jason is portrayed as a naive rich white kid, without any kind of experience or training whatsoever, who is suddenly dropped into the mouth of hell when he and his pals are kidnapped. It's meant, I guess, to make you relate to him, if not in terms of gender or race, then at least in terms of the fact most gamers are just regular people, not military professionals. No matter how many movies I've seen or games I've played, if you put me on an island and handed me an assault rifle, I'd be lucky to know how to properly load the thing, let alone shoot someone in the head with it. I don't know how to ride a jetski. I can't operate a heavy machine gun. And don't get me started on firing a bow and arrow. If that really was me on that island, or someone like me, the biggest challenge would be learning how to even use a gun. So it's jarring to see the whole "helpless dude" routine confined to the game's story, while the actual game has you playing with the skillset of Rambo or Master Chief. I mean, in the game's opening section, you can't even crawl without guidance. A bit later, there's a point where your girlfriend says she's worried about your relationship. Um, sure, so am I, more worried than I was about the three panthers I just killed with a knife, or the jeep I blew up while flying over it on a zipline. The gulf between the person the story is telling you you're playing and the way you're actually playing is similar to that found in, say, Grand Theft Auto games, where murder is treated as a big deal on a mission... even though you just ran over 17 people on the way over. But in those games, it's almost a joke, so absurd is the nature of the game. 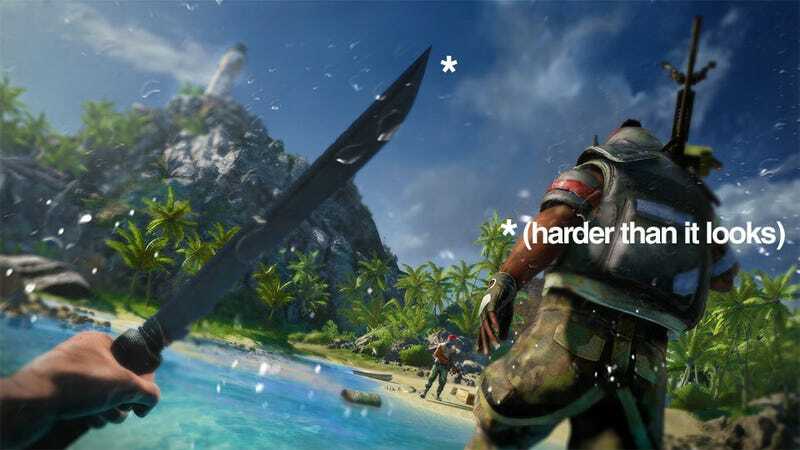 In Far Cry 3, things are so much more immediate, your premise taken so much more seriously that for much of the game's opening sections it just feels stupid. More importantly, it feels like a missed opportunity. I think there's scope out there for a game to actually play as though you're a rookie. Make you learn how to fire a gun not by simply pointing a cursor at something, but with, say, minigames teaching you how to load and ready the weapon. If you're going to just suddenly jump into all these exotic vehicles, make you struggle to learn how. If you're going to make some kid do something as complex and messy as skin an animal, make you have to earn it by doing it properly. This might sound boring to you, but I think with the right application, pacing and introduction, it'd be fantastic. By replicating a sense of helplessness you're creating tension and excitement, in which every single kill is a victory, which also has the knock-on effect of making those victories more rewarding. I'm not knocking Far Cry 3 for not doing this. It's the game its designers wanted it to be, and the gulf between the story's Jason and my Jason is quite literally the only thing I'm finding wrong with it right now. But the disappointment I felt when the game didn't follow on with that opening premise has certainly left the door open, even if it's just in my heart, for another game to come along and make me a helpless, accidental hero.